By sending this booking your details will only be sent to Lockside and will never be shared with other third parties. By clicking this box you agree to the Terms and Conditions set out above. You can book to reserve an area of Lockside for you and your friends. Just enter your requirements below to see what they have to offer. Extensive cocktail menu including Mason Jar Shaker menu. Large covered terrace area with heating overlooking west yard market and the lock. What did you think of Lockside? Definitely my fav venue in Camden - can't beat it and a must visit if you're in the area! This review is for Lockside, which is an awesome bar in itself, but specifically for a night there called Dem Dayz: Great night out, tune after tune after tune, friendly crowd and the drinks prices are pretty reasonable as well, excited to go again! 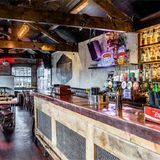 I went to Lockside one day when I was around Camden looking for a place to go and it was late night, I've found a great and fun place with a huge range of drinks, very nice people working and it was a lovely atmosphere and great music. Love it! I work near the market, so I'm often at Lockside for an after work drink. I love that place! The food is simple but very tasty, the coctails are great and the staff is always nice! Had great time at Lockside Lounge last week end! amazing food and great cocktail kept us for a few hours! the view from the balcony is a must! Hi! What a cool bar! Right in the middle of the market and with a huge balcony overlooking the canal and the yard, we had great food and drink! Must try the burger and their cocktail. Spend a few hours there and had a great time! Jason 345 I run Lockside Lounge and do not have a single employee called Christian working for me and never had? I'd appreciate it if you didn't accuse people who write good reviews of the place of working there? Lockside is renowned for being a friendly bar with a great vibe and atmosphere so your comments about fights is also false? I think you are confused as to which bar you are reviewing. Hello! I don't work there, which bit haven't you experienced? I generally go of a Friday eve with work, they do a free hotdog thing for the after work crew on the nights that I have been to. I always have a brilliant time at Lockside, I’ve had my birthday there a couple of times and its always been a fab night! They have a great long balcony/terrace area which has a real holiday vibe as you’re overlooking the market and Camden lock. Food is nice too, reasonably priced, and they often have a free hotdog BBQ on the balcony on Fridays after work– bargain! 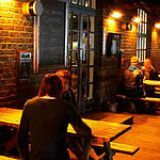 Whenever I have been there Lockside has had been one of the most friendly crowds in Camden, there’s always a great party atmosphere! On Fridays and Saturdays they have some fab DJ’s playing in the evenings, there’s also a much bigger dancefloor now that the DJ booth has been re-sited at the back of the room, so its strikes a good balance between being a pub/bar and somewhere where you can have a proper boogie as well! The DJ's always get me and my girlfriends straight on the dancefloor! Also the décor is amaaaazing, they have beautiful really unique painted bird murals all over the walls. Top marks for Lockside! I always have a brilliant time at Lockside, I’ve had my birthday there a couple of times and its always been a fab night! They have a great long balcony/terrace area which has a real holiday vibe as you’re overlooking the market and Camden lock. Food is nice too, reasonably priced, and they often have a free hotdog BBQ on the balcony on Fridays after work– bargain! 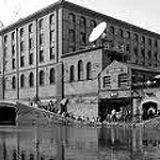 Whenever I have been there Lockside has had been one of the most friendly crowds in Camden, there’s always a great party atmosphere! On Fridays and Saturdays they have some fab DJ’s playing in the evenings, there’s also a much bigger dancefloor now that the DJ booth has been re-sited at the back of the room, so its strikes a good balance between being a pub/bar and somewhere where you can have a proper boogie as well! The DJ's always get me and my girlfriends on the dancefloor! Also the décor is amaaaazing, they have beautiful really unique painted bird murals all over the walls. Top marks for Lockside! Great bar for a birthday! Danced all night Saturday in-between delicious cocktails! Will be back next year Lockside...THANK YOU!! I stumbled upon this delightful establishment about 3months ago now, it is situated above a cosy cafe that make the BEST hot chocolate in the world! Lockside is a long bar set opposite the lock and has a fantastic view really quite beautiful. My girlfriend and I had the curried chicken sandwich, incredible, and the burger, unbelievable. The food really was of outstanding quality and the service was unparalleled, smiles, manners, fast. We stayed into the evening, the atmosphere was lovely they seem to do a lot of cocktails, but also had a very good beer and wine selection. One of the bartenders even broke out into operatic song at one point. To summarize, this bar had character, mouth watering food and great service. I can't wait for summer on their terrace! I booked my partner's 30th Birthday here for 30 people. They party was great and I have Lockside to thank for that. The music was very good, the drinks were tasty and made with care (one of the bar staff made the best Old Fashion I've every had), the venue had a great atmosphere, and the staff were top notch (a big thank you to Chris, Emily, and Nathalie for taking care of us). I would highly recommend this place for a date, a fun night out, or a party! Excellent bar, excellent staff, excellent atmosphere!! We recently celebrated a birthday at the Lockside Lounge and had booked a table a few weeks in advance, got there and they were very accomodating, even moving us at our request!! They had a Brazilian theme happening so amazing BBQ food and really cheap prices and later on in the evening a 30 piece Brazilian band. It was a brilliant night, with a great laid-back atmosphere and vibe to it! Thanks guys!! The balcony area makes it feel like you could be anywhere in the world, especially with the hustle bustle of the Camden Lock, creating great vibes. The staff are brilliant, making great cocktails that aren't for the faint-hearted. This is a cool, unpretentious bar, that caters for everyone for any occasion. I would highly recommend. My wife and I visited Lockside Lounge last May. It was really great! Ambiances, drinks, food, DJ, service, all very good. Funny and beautiful people. We stayed from 1 pm until 10 pm !! Lots of Gosling's rum !! Boblucio from Brazil. Held my 40th birthday party at the Lockside last week and it was great! Guests loved the ambience, the food and the terrace was a great place to socialise. All arranged via the internet, phone and email and the guys at the Lockside were attentive and enthusiastic - I'd thoroughly recommend to anyone! Always enjoy a night out at Lockside...the staff are friendly and happy to help, the drinks and food seem to get better every time I go back...looking forward to some of their summer BBQs and watching the catching some World Cup games there! I'm going there for about 2 years now whenever I'm in Camden and really love the place. Food is good drinks not too expensive and it's always busy with a nice crowd. A cool drinking establishment in the midst of the Camden chaos. Overlooking the picturesque Camden Lock, a few minutes from the hustle and bustle of the High Street, is the Lockside Lounge. Fitting in with the quaint atmosphere of West Yard, Lockside Lounge is traditional in build, with rustic stone walls and wooden decking outside. In the summer the medium-sized terrace is filled with picnic tables and thirsty punters. The views over Camden Lock are magnificent, and on a hot summer’s day expect the outside area to be packed. Inside, the bar is a long shape, not dissimilar to a canal boat. The loos are at the far end, the main bar runs along the length of the room, and there are various styles of tables, chairs and couches positioned randomly inside. The decor is funky but minimalistic. A few bright, colourful paintings adorn the walls, but the room is generally clutter free, offering plenty of places to stand. Another plus is the bar’s free WiFi, available to all customers. As with most large bars, on a Friday night after work the Lockside Lounge quickly fills to offer a busy, loud atmosphere. Several offices nearby empty out at 5.30pm and pour into the bar. 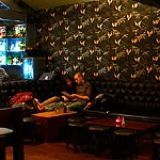 The vibe is buzzing and upbeat - everything a bar in Camden should be. During the week, however, it quiets down. Perfect for a work lunch with clients or for a chance to catch up with friends over a coffee. At the weekends there is a DJ spinning everything from hip hop to disco. Food is available at the Lockside Lounge from midday-9pm daily, except on Fridays when the kitchen closes at 6pm. The menu on offer depends on the time of the year. During the summer months, a lighter menu comes into play, offering tasty dishes such as tempura prawns with sweet chilli (£5.50), tri colore salad (£8.95) and spicy bean burger and chips (£8.00). For those who like to share, a scrumptious Spanish platter with a tantalising selection of meats, breads and olives is available. During the winter, the menu offered is aimed at comfort food. pork and leek sausages with onion mash will set you back £7.95, fish and chips are £9.50, and a Scottish beef burger costs £9.45. If you are lucky enough to pick a day when it’s not raining, Lockside Lounge also offers a BBQ menu with various meats, salads and garnishes on offer. The drinks at Lockside Lounge are on the slightly expensive side. A draught pint of Heineken costs £3.80, and a Fosters is £3.50. There’s also a wide selection of bottled beers on offer, including Corona, Leffe, Budva and Adnams Bitter, ranging from £3.50-£3.90. That said, you can’t put a price on sipping a cold pint watching the sun go down over the Regent’s Canal. A large, popular bar offering the potential for a quiet lunch or a crazy night out. The views, outdoor terrace and BBQ make this worth a visit, especially in the summer.